For other uses, see Mexicana (disambiguation). Compañía Mexicana de Aviación, S.A. de C.V. (commonly known as Mexicana) was Mexico's oldest airline and one of the oldest continuously single-branded airlines (after KLM, Avianca and QANTAS), and Mexico's biggest and flagship airline before ceasing operations on August 28, 2010. The group's closure was announced by the company's recently installed management team a short time after the group filed for Concurso Mercantil (Mexican law equivalent to US Chapter 11) and US Chapter 15. On April 4, 2014, a judge declared Mexicana bankrupt and ordered to start selling off the company's assets to repay the airline's obligations. The headquarters of the company were in the Mexicana de Aviación Tower in Colonia del Valle, Benito Juárez, Mexico City. In addition to domestic services, Mexicana operated flights to various international destinations in North America, Central America, the Caribbean, South America and Europe (until August 31). Their primary hub was Mexico City's Benito Juarez International Airport, with secondary hubs at Cancún International Airport, and Guadalajara's Don Miguel Hidalgo y Costilla International Airport. Mexicana's main competitors were Aeroméxico (although the two companies "codeshared" on several routes), and low-cost carriers such as Volaris and Interjet. Mexicana was North America's oldest airline and the world's fourth oldest airline operating under the same name, after the Netherlands's KLM, Colombia's Avianca and Australia's Qantas. In 2009, the Mexicana group of airlines (including Mexicana Click and Mexicana Link) carried just over 11 million passengers (6.6 million on domestic routes and 4.5 million on international routes), using a fleet of some 110 aircraft. Over the three years prior to folding, the Mexicana group had increased their share of what was a burgeoning domestic market, from around 22% at the beginning of 2007 to somewhere between 28% and 30% for most of their final 12 months. This was achieved through downsizing mainline Mexicana operations whilst ramping up activities at Mexicana Click (originally envisaged as a low-cost carrier) and Mexicana Link (its CRJ-operating subsidiary based at Guadalajara). After first joining Star Alliance in 2000, Mexicana left the alliance in 2004 before joining Oneworld on November 10, 2009. Mexicana entered bankruptcy protection in August 2010 in an attempt to restructure its business operations. On August 27, 2010, Mexicana announced it would suspend operations indefinitely effective noon August 28, 2010. Its subsidiaries Click and Link have since ceased their operations as well. On February 24, 2012, Mexicana Airlines announced for the first time in this Chapter 11 period that Med Atlantic bought the airline for $300 million. William Lantie Mallory and George Rihl headed Compañía Mexicana de Aviación ("Mexican Aviation Company" or "Mexican Airline Company"), a competitor to CMTA; they acquired the latter's assets in 1924 and the company that emerged existed until 2010. In 1925 Sherman Fairchild purchased a 20% stake in the Mexican airline, introducing Fairchild FC2 airplanes in 1928. In February 1929, Juan Trippe of Pan Am took over the majority of the airline's stock, and the company opened its first international route, with service to the United States. Mexicana used the Ford Trimotor plane to operate the Mexico City-Tuxpan-Tampico-Brownsville, Texas, USA, route. Charles Lindbergh piloted the first flight on this route. The 1930s saw route expansion and service improvements. Mexicana opened a route from Brownsville to Guatemala City, stopping over at Veracruz, Minatitlán, Ixtepec and Tapachula. In addition, new routes were opened to El Salvador, Costa Rica and Cuba, in addition to Nicaragua and Panama, made possible by their association with Pan Am via Pan Am's Miami base (Pan Am had undertaken flights from Mexico City to Miami.) Mexicana became the first foreign airline ever to fly to Los Angeles, when it began flights on January 3, 1936. The company expanded its fleet during that decade, with the addition of eight Fairchild FC2s and three Fokker F.10s. One of the Fokker F.10's, tail number X-ABCR, crashed at Miami on August 7, 1931 but no other details are available. The 1940s were primarily a period of domestic growth, although an international service began linking Mexico City and Havana. Routes were opened to Monterrey, Nuevo Laredo, and Mérida. Additionally, a night flight to Los Angeles was established, which added to the company's night-time service to Mérida. Though Mexicana initially used Douglas DC-2s for these flights, over time they were replaced by larger aircraft, such as the Douglas DC-3s known as El Palacio Aéreo (The Air Palace) for their luxury and comfort and, later, Douglas DC-4s. The DC-4 allowed Mexicana to offer a non-stop service from Mexico City to Los Angeles. During the decade, Mexicana established a certified pilots' school in Mexico City. The 1950s saw the airline's growth slow, though the fleet was modernized with the addition of Douglas DC-6s, and staff training improved with the opening of a flight attendant school. The DC-6s were put to work on the Mexico City to Puerto Vallarta and Mexico City to Oaxaca routes. Service to San Antonio, Texas began later in the decade. In the 1960s four De Havilland Comet 4C jets were bought: one is currently being restored by the Seattle Museum of Flight. The Comets' arrival saw Mexicana join the jet age on July 4, 1960 with a flight from Mexico City to Los Angeles. Despite its use of advanced aircraft, competition was stiff, and by the late 1960s, the company faced bankruptcy. Amid the difficulties, the airline received its first Boeing 727-100. In 1967, the airline was serving six destinations in the U.S. including Corpus Christi, Dallas and San Antonio in Texas as well as Chicago, Los Angeles and Miami, and was also flying internationally to Havana, Cuba and Kingston and Montego Bay in Jamaica. The financial situation brought about a change in the airline's administration and on January 15, 1968, Mexican Crescencio Ballesteros, took over as chairman. Manuel Sosa de la Vega was appointed as President and CEO. The new management team's strategic plan soon saw the airline recover financially. Despite its revival, 1969 was a difficult year for the airline as it lost two Boeing 727s. The first was in bad weather en route Mexico City to Monterrey; the second was flying between Chicago and Mexico City. In 1971, Mexicana started flights to Luis Muñoz Marín International Airport in San Juan, Puerto Rico a route it would maintain for more than 25 years without interruption - (mainly from Mexico City, for a period the airline flew the routing San Juan-Mérida-Mexico City and vice versa), and to Denver, Colorado. The jet fleet kept expanding and eventually consisted of 19 jets, the largest jet fleet in Latin America at the time. They also started a flight simulator service with a 727 simulator at their hub in Mexico City International Airport. By this time Mexicana had the largest fleet of 727s outside the USA. For its 50th Anniversary Mexicana de aviavion was given a monument for being the First Airline of Mexico. After 2010 the monument has been a symbol of Aviacion in Mexico and to all of the Fallen Airlines that once served the country. During the 1980s, Mexicana's growth was static. However, a few events touched the company. In 1981, three McDonnell Douglas DC-10-15s joined the company's fleet and began making their way through the airline's Caribbean routes. This was the first wide-body aircraft type Mexicana ever operated and was intended for use on high-density routes. In 1982, the Mexican government acquired 58% of the airline, before privatizing it in August 1989. In 1984, construction of the company's new corporate headquarters on Xola Avenue, Mexico City finished the resulting 30-story building was designed to resemble an air traffic control tower. In March 1986, a Boeing 727, Mexicana Flight 940, en route to Puerto Vallarta caught fire in-flight and crashed in the mountains of western Mexico, killing everyone on board. This is the most recent fatal accident involving a Mexicana aircraft. In 1988, Aeronaves de Mexico (now operating as Aeromexico), Mexicana's closest rival, declared bankruptcy. Consequently, Mexicana took over some of Aeromexico's longer flights during the 1990s, including flights to Canada and South America. The 1990s brought a series of changes. 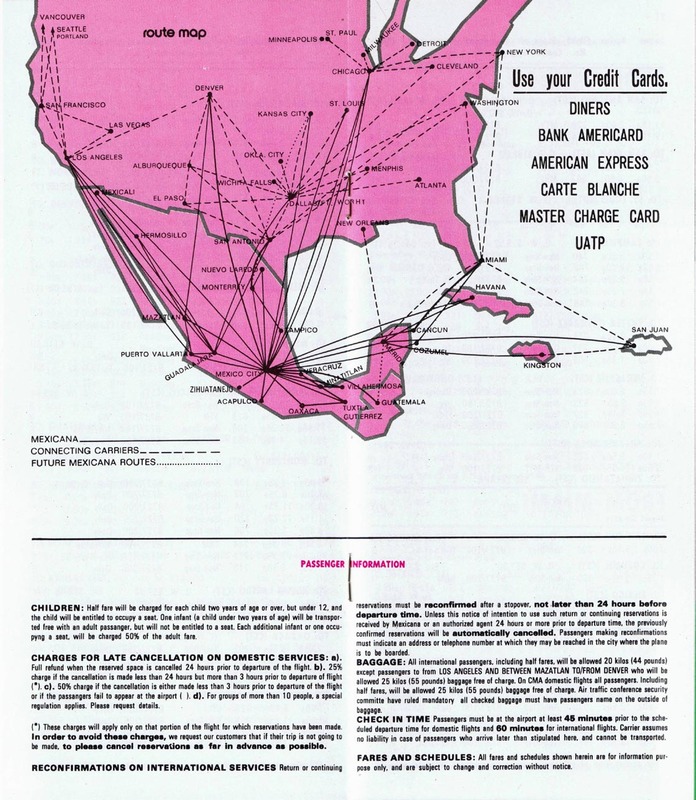 At the beginning of the decade in 1990, Mexicana was serving fourteen destinations in the U.S. including Baltimore, Chicago, Dallas/Fort Worth, Denver, Los Angeles, Miami, New York City, Orlando, San Antonio, San Francisco, San Jose, CA, Seattle and Tampa as well as San Juan, Puerto Rico with additional international service to Guatemala City, Guatemala; Havana, Cuba and San Jose, Costa Rica. Deregulation of the Mexican airline industry brought new competitors such as LaTur, SARO and TAESA. Seeking to remain competitive, the airline updated their fleet with European-built Airbus A320s in 1991 and Dutch Fokker 100s in 1992. In 1993, a reorganized Aeroméxico took over as the company struggled financially. During the mid-1990s, the Mexican economy was hard-hit by the devaluation of the Mexican peso and Mexicana, Aeroméxico, and their regional affiliates were nationalized when their parent company, CINTRA (Corporación Internacional de Transporte Aereo), was taken over by the government. The airlines remained in their merged state until 2005. As happened in 1967, a new management team was hired, this time headed by President and CEO, Fernando Flores. The company was reorganized and rationalized, with a new emphasis placed on international service. Unprofitable routes were cut and the DC-10s were retired. The airline ventured deep into South America by adding flights to Lima, Peru, Santiago de Chile, and Buenos Aires, Argentina and further into North America, adding flights to Montreal, Canada. To operate these new and longer routes, the airline leased Boeing 757-200s. Another aspect of this reorganization involved the creation of alliances. Mexicana was part of regional alliances LatinPass and Alas de America, and they later formed an alliance with United Airlines. This latter alliance brought Mexicana into the network of global alliances, as it eventually led the airline into the Star Alliance. Recognizing the usefulness and importance of the Internet, the airline launched a website and eventually included a reservation center. Also around this time, Mexicana adopted a new color scheme, with assorted colors on the tails of their planes. 2005 was an important year as the airline was sold and several low-cost carriers were established in Mexico. Mexicana rebranded its regional subsidiary, Aerocaribe, as "Click Mexicana" and promotes it as a low-cost carrier. This is part of the company's plan to remain competitive as the aviation industry changes and competition intensifies. Another component includes increasing international presence. Also, the color scheme was changed again to a dark blue tail and blue lettering on a white background. Despite government announcements indicating that the airlines were going to be privatized, that move did not occur until November 29, 2005, when CINTRA sold Mexicana and its subsidiary, Click Mexicana, to the Mexican hotel chain Grupo Posadas for US$165.5 million. The road to privatization was long and winding. The government reversed its course on several occasions. At times, they proposed to sell Mexicana and AeroMéxico separately; other times, they proposed to sell them together to increase the bid price. They also proposed to sell the companies merged, but separate from their regional affiliates to increase competition. Several companies expressed interest in purchasing one or both of the airlines. For example, Iberia Airlines of Spain announced plans to buy part of both Mexicana and Aeroméxico. However Mexicana's owners rejected the offer possibly[dubious – discuss] because another Iberia-owned Latin-American airline, Viasa of Venezuela, had gone bankrupt under Iberia's ownership. Further, Aerolíneas Argentinas had previously rejected a similar offer by Iberia. On July 12, 2006 Mexicana announced that it intended to begin service to several new destinations in the United States including Detroit and Charlotte. It intended to return to Puerto Rico, but the service came back only as a charter operation. It was also negotiating with Arkansas officials to begin service to Little Rock National Airport. Mexicana was named "Best Airline in Latin America" in 2006 and "Best Business in Central and Latin America". On April 9, 2008, Oneworld invited Mexicana to join the alliance and the airline was expected to join the alliance on November 11, 2009, together with its two subsidiaries MexicanaClick and MexicanaLink, thus adding 26 destinations to the network. Iberia was the sponsor of Mexicana's invitation into the Oneworld alliance. Mexicana was to compete with SkyTeam members Aeroméxico and Copa Airlines (which later left SkyTeam, possibly to join Star Alliance because of Continental Airlines' move to that alliance) and Star Alliance potential member TACA and member TAM for service between the US and Europe and Latin America. Mexicana was to start new flights to the US, Europe and Brazil to better leverage its position. In October 2008, Mexicana announced three new destinations, London (Gatwick), São Paulo (Brazil) and Orlando (U.S.). Service commenced December 8 for São Paulo (GRU) and Orlando (MCO), followed by London (LGW) on January 9. With this service expansion, Mexicana became the second Mexican airline with service to Europe and Brazil (Aeromexico has long established service to Paris, Madrid, Rome and Barcelona in Europe, and São Paulo in Brazil), and first with service to the United Kingdom. The Orlando route was operated with a medium-range Airbus 320, London and São Paulo were operated with 2 leased Boeing 767-200ER. In addition, Mexicana announced a Mexico City to Madrid route to compete with Aeromexico and compliment its partner's (Iberia) existing service. Mexicana announced that it will begin service to Madrid beginning in Feb/09 through the acquisition of 2 Airbus A330-200 not taken by XL due to bankruptcy. These aircraft types are well suited for medium-density, long-range travel. The company also unveiled the new colorful livery on November 27, along with "Mexicana Click" brand-new name for Click Mexicana. On February 4, 2009, Mexicana won a concession to operate a new feeder airline to complement the routes currently covered by Mexicana and Mexicana Click. The new airline was to be called MexicanaLink and operate in low-density routes to feed mainline operations from Guadalajara's airport. The airline flew Canadair CRJ-200 regional jet aircraft. Also in February 2009, Mexicana applied to the US Department of Transportation to initiate daily, non-stop service between Guadalajara, Jalisco and New York utilizing either an Airbus A319 or the larger Airbus A320. On February 25 Mexicana joined the Airbus MRO network evaluating the Airbus A350. Mexicana filed for Commercial concurs (Mexican law equivalent to US Chapter 11) and US Chapter 15 on August 3, 2010 in both the U.S. and Mexico, following labor union disputes; a debt of US$125 million was reported. On August 5, 2010, Mexicana filed a motion to the Superior Court of Quebec (Commercial Division) of the District of Montreal to obtain the recognition of foreign proceedings regarding Section 46 and following of the Companies Creditors Arrangement Act (CCAA). Subsequently, the airline scaled back its operations, suspending ticket sales and announcing termination of selected routes. In early August 2010, the airline offered pilots and flight attendants a stake in the business in exchange for new labor terms. On August 24, a Mexican consortium called Tenedora K announced that it had bought 95% of Nuevo Grupo Aeronáutico; pilots would hold the other 5%. After 89 years of service, Mexicana suspended all operations at noon CDT on August 28, 2010. The last Mexicana Flight was on August 28, 2010 from Mexico City to Toronto, Canada Flight MX 866 4:15 PM Departure. Aeroméxico offered discounted tickets to passengers stranded by Mexicana's suspension of operations. American Airlines and American Eagle Airlines also offered assistance, providing help to passengers between the 48 contiguous U.S. states and Mexico. In November 2010, PC Capital SAPI, a Mexican private-equity firm, offered unions and other creditors a 1.9 billion peso ($155 million) proposal to rescue the bankrupt airline. The offer included giving unions 975 million pesos in cash and arrangement of a seven-year, 926 million peso loan paying monthly interest to the workers. The unions would have received an equity stake in exchange for the remaining 2.85 billion pesos Mexicana owes them. The proposal would have seen the airline return with 28 planes, flying 17 international routes to the U.S. and Central America and seven domestic services. Creditors including Grupo Financiero Banorte SAB and Mexican development bank Banco Nacional de Comercio Exterior SNC viewed the proposal favorably, as did the government. The proposal had Government support, with Mexico's government hopeful that the grounding would have been resolved in time for the December travel season, when millions of local and foreign tourists will flock to resorts such as Cancun for holidays. "Our goal must be that Mexicana returns to the skies by the December high season," Labor Minister Javier Lozano said at a press conference. Mexicana planned to restart services in 2011, operating 11 routes with 7 leased aircraft. Many of its domestic destinations were taken over by its former partner, Aeromar, VivaAerobus, and its low-cost competitor, Volaris. On March 4, PC Capital announced that it withdrew from the process leaving Mexicana and the Mexican government without a viable option. Mexicana then announced a plan to offer only charter flights. On November 11, the Mexican government announced that Iván Barona would invest 400 million dollars in Mexicana Airlines. Barona stated that Mexicana would resume operations in December 2011, with an aggressive business plan to regain all the territory lost, beginning with 9 Airbus A320s, and increasing the fleet size to 100 airplanes in 18 months. Barona failed to meet the conditions of the transaction, including a November 15 deadline, and the plan was terminated by the bankruptcy trustee. A Mexican Judge declared that Mexicana was bought by Grupo Med Atlantica and has announced it may resume operations in 2012. On May 11, 2012, all the shares were transferred from Tenedora K to Med Atlantica. Christian Cardenas and the Spanish Company Med Atlantica are now currently pending for an Operation Certificate to restart operations soon. Med Atlantic will invest $300 million to restart the airline with seven aircraft and a payroll of 2,000 workers. The company was formerly in a first operational phase and would have begun with 11 routes which meet at airports: Mexico City, Acapulco, Cancun, Guadalajara and Monterrey. Med Atlantica was declared out of the process because Christian Cadenas (Med Atlantic representative) failed to cash in the resources needed for a possible restart of the company. In December, Mexicana Airlines had 3 possible investors, Iván Barona owner of a mining group in Mexico, Grupo Fides Gestión Financiera an investment group from Monterrey and an unknown investor. Ivan Barona had until December 29 to invest 100 million dollars to Mexicana Airlines. After he failed to invest money, Grupo Fides has the opportunity to prove the group has the intention to buy Mexicana Airlines. As of 2013, Med Atlantic and Grupo Fides are still trying to invest money in Mexicana Airlines. On Friday April 4, 2014 Federal Judiciary Council announced that a judge declared the end of the bankruptcy proceedings due to a lack of credible investors. In 2015, many of Mexicana's former oneworld partners signed codeshare agreements with Interjet, one of Mexicana's ex-main rivals. The alliance has stated that it's interested in recruiting a new airline from Mexico. This would fill in the void left by Mexicana in 2010. Mexicana was listed as an inactive member of the alliance until 2017. Mexicana's 8000 ex-workers will receive their fair and just "liqudation". Pension to retired ex-workers even if the airline doesn't return to service. An aggressive plan to "revive" the airline and return it to the skies during his government. Seek credible investors to gather funds to recover it fleet. Hire new workers and ex-workers and a new administration under his name. Restart all operations during a high season. With an aggressive plan to gain all territory lost. When Mexicana announced the flight cuts and possible bankruptcy, the Gastón Azácarraga administration said it was the result of the high labor cost (pilots, flight attendants etc.). In a fast move Gastón Azácarraga left the company, leaving the employees to deal with a new administration (Tenedora K). This new entity was unknown and with no resources to restart the company. Until then, the Gastón Azácarraga administration had been subject to criticism. The Mexican government did not support the airline in its "Concurso Mercantil" (Chapter 11) process as they did with CEMEX and Comercial Mexicana Chapter 11 processes. On December 21 a Supreme Court Judge ordered the detention of Mexicana's former CEO, Manuel Borja Chico, for a 54-million-peso tax evasion under his administration. The new administration of President Enrique Peña Nieto declared that the government would investigate the Mexicana Airlines bankruptcy and would find those responsible, in parallel with restructuring the airline. On February 19, 2014 Mexico's attorney general's office asked a federal judge to issue an arrest warrant for former owner and president Gastón Azcárraga Andrade, in connection with suspected money laundering while he ran Mexicana. It was discovered that in 2006, Mexicana created a trust, Fideicomiso 589, to which more than 199 million pesos was extracted from Mexicana supposedly for the benefit of employees. However, at least 110 million pesos was used to purchase Mexicana shares from Grupo Posadas, also controlled by Azcárraga, with no benefit to Mexicana employees. Azcárraga - whose relatives control media giants Televisa and Univision - remains a fugitive of Mexican justice living in luxury in the United States. In 2005 Aerocaribe was renamed Click Mexicana and replaced its fleet of McDonnell Douglas DC-9-30s with Fokker 100 twin jet aircraft. Click was a wholly owned subsidiary of Mexicana de Aviacion. Mexicana used Click as a low-cost airline to counter low-cost competitors such as Aviacsa, Interjet, A Volar and Volaris. Mexicana employed Click as a domestic feeder line on lower-passenger routes and times, while Mexicana focused on international and longer domestic routes. Mexicana considered adding the Airbus A319 to Click's fleet to serve destinations in Central America and the Caribbean. Click had 22 Fokker 100 jets in an all economy-plus layout. The cabin had grey, leather seats with a 35° pitch and a Click logo on the headrests. In 2008 Mexicana and Click were invited to the Oneworld alliance at the member and member affiliate level, respectively. Mexicana rebranded Click Mexicana as MexicanaClick with the announcement of the new corporate livery late-November 2008. MexicanaClick highlighted the Mexicana linkage. Mexicana said it signed an agreement in March 2009 with Boeing to lease 25 Boeing 717-200 jetliners to be operated by MexicanaClick. The B717s were planned to replace the Fokker F-100 aircraft being flown by MexicanaClick. Sixteen of the B717s had been previously operated by Midwest Airlines. Terms of the lease werent disclosed. 1960s-mid-1970s "Es Mexico... con alas (It's Mexico... with wings)"
Early 1970s-1973 "The airline that knows Mexico since 1924"
Late 1970s-early 1980s "Mas alas para Mexico (More wings for Mexico)"
Early 1980s "Primera linea aerea de Latinoamerica (First airline in Latin America)"
Mid-1990s "Navegar es volar (Sailing is flying)"
2000s "El placer de volar sin limites (The pleasure of flying without limits)"
2003-2005 "With the most modern fleet in the world"
2006-2007 "Nobody knows Mexico like Mexicana"
Mexicana introduced new livery in the second half of 2008. It consists of a "eurowhite" fuselage with the front in marine blue outlining a stylized eagle. The tail features the same eagle in marine blue with a light-blue background. The new graphic design is the work of Danish design agency Design:Success and Kristofer Matti, Peter Danroth & Gabriel Martínez Meave, a renowned Mexican designer who has received several international awards, most recent of them from the Type Directors Club. Mexicana offered "Clase Elite", or business class, on all flights. Warm meals were served on all domestic and international flights longer than 40 minutes. Passengers also received snacks throughout the flight, selection of meals, and refreshments. The seats on the Boeing 767-300ER were 23 inches across and recline 160°; while seats on the Airbus 320 were 22 inches across and recline approx 100° degrees. The seats were dark blue with small Aztec logos embossed on the seat with a white headrest cover displaying Mexicana's logo in black. Seats with adjustable headrests and electrical controls. Portable entertainment units with AVOD. Airline magazines Vuelo and Elite. Complimentary newspapers on flights departing from hubs and focus cities. 10 Music channels and complimentary headphones. Recliner seats with adjustable headrests, lowerback support, adjustable footrest, and electrical controls. Electric bed-seats with 3.5 feet of separation between rows. Amenity Kit on flights to Europe and to South America. Duty Free catalogue on select international flights. Visual entertainment provided through overhead-compartment-screens. MexicanaGo (formerly frecuenta) was the frequent-flyer program of Mexicana from the late 1990s until August 28, 2010 when Mexicana suspended operations. Up to 2011, Mexicana had been involved in a total of 26 incidents, including nine fatal. On June 4, 1969, Flight 704 crashed near Salinas Victoria; some 20 miles north of the city of Monterrey. All 79 people on board were killed, including Mexican tennis star Rafael Osuna. The aircraft was a Boeing 72764, with tail number XA-SEL, and was approaching Monterrey's airport. It had made a continuous descent in the last 5 minutes before impact. The pilot turned left instead of right once the aircraft passed over the Monterrey VOR, apparently not knowing his exact position at the time. On September 21, 1969, another Mexicana Boeing 72764, with tail number XA-SEJ, crashed short of the runway 23L at Mexico City International Airport. Of the 118 people on board, 27 died. The aircraft had been cleared for an ILS approach when it suddenly lost altitude and hit the ground. After becoming airborne once again, the plane crashed into a railway embankment. At the time of the impact, the aircraft was in a normal landing configuration. Since the flight data recorder had been installed improperly two days before and there was no cockpit voice recorder, the cause of the crash couldn't be established. On March 31, 1986, Flight 940 crashed in Las Mesas; near Maravatio, Michoacan. All 167 people on board the Boeing 727264 were killed, making it the deadliest plane crash in the country's history and the deadliest ever to have involved this type of aircraft. The left main gear brake was overheated during the take-off run. After reaching an altitude of 31,000 feet, a tire in the left main landing gear burst and crippled the plane's controls, causing an in-flight fire and an explosive decompression in the process. It was found that the tire had been filled with air rather than nitrogen, leading to a chemical explosion within the tire itself. Puertorriqueña de Aviación (established 1941), inspired by Mexicana de Aviación and Cubana de Aviación. ^ "Mexican Aviation Tower." Mexico City Official Website. Retrieved December 4, 2010. ^ "Directory: World Airlines". Flight International. April 10, 2007. p. 50. ^ a b "Mexicana's uncertain future: Big network shake-up posed by possible removal of biggest player; 30% of domestic market and 20% of US-Mexico market up for grabs". anna.aero. ^ "Mexicana sinks into restructuring". Retrieved 2010-08-17. ^ Mozee, Carla (August 27, 2010). "Airline Mexicana to suspend operations indefinitely". MarketWatch. Archived from the original on August 28, 2010. Retrieved 2010-08-27. ^ "Mexico to sell Mexicana Airline," Houston Chronicle, May 24, 1989. ^ "166 Killed In Jet Crash". Chicago Tribune. April 1, 1986. ^ "Mexicana to become part of oneworld on 10 November" (Press release). Oneworld. September 21, 2009. Retrieved September 22, 2009. ^ Grupo Mexicana was granted a concession for a new airline. Mexicana.com. ^ Kary, Tiffany (November 8, 2010). "Mexicana de Aviacion Files for Bankruptcy in Mexico". Bloomberg. ^ Grupo Mexicana Informa Home. Cmainforma.com. ^ Roeder, Jonathan (August 10, 2010). "Mexicana Offers Unions a Stake in Holding Company as Part of New Contract". Bloomberg. ^ "Mexican consortium attempting Mexicana rescue | ATW Online". August 24, 2010. Retrieved 2010-08-24. ^ "Aeromexico Informs." Aeroméxico. Retrieved August 29, 2010. ^ "American Airlines and American Eagle help customers affected by Mexicana airlines service suspension." American Airlines. August 30, 2010. Retrieved August 30, 2010. ^ "Puerto Vallarta Bridge And Mexicana Travel Policies." American Airlines. September 1, 2010. ^ Mexico TODAY. "Mexicana unions, creditors get $155 million bid to save company". Retrieved 2010-11-20. ^ Bloomberg. "Mexicana Wins Legal Shield to Aid Mexican Bankruptcy". Retrieved 2010-11-20. ^ Harrison, Crayton (November 10, 2010). "Mexicana Unions Get $155 Million Bid to Save Company". Bloomberg. Retrieved 2010-11-20. ^ http://global.abi.org/. "Mexican Government wants Mexicana Flying Again". Retrieved 2010-11-20. ^ a b Mexicana Plans Feb. 14 Return To Revenue Service. Aviationweek.com (January 26, 2011). ^ "Mexicana Airline To Resume Flights 'Soon' With Seven Planes". The Wall Street Journal. January 24, 2011. Archived from the original on January 28, 2011. ^ Firman acuerdo formal para capitalizar Mexicana de Aviación. Noticierostelevisa.esmas.com (November 11, 2011). ^ Inicio de operaciones Mexicana con 9 aviones: Barona. Con Ciro Gómez Leyva. Radioformula.com.mx. ^ Mexicana De Aviacion Fue Acquirida Por El Grupo Hotelero Med Atlantica Y Se Disponen A Volver A Retomar La Aerolinea. Aplenovuelo.com. ^ "Mexico ends bid to revive Mexicana airline" (Archive) Associated Press at Yahoo! News. April 5, 2014. Retrieved on April 7, 2014. ^ a b "AMLO y Mexicana de Aviacion". www.lopezobrador.org.mx. Retrieved August 24, 2018. ^ Aprueban concurso mercantil de Mexicana Negocios. CNNExpansion.com (August 5, 2010). ^ "ASN Mexicana Aircraft Occurrences". AviationSafety.net. ^ "Famous people who died in aviation accidents 1960s". PlaneCrashInfo.com. ^ a b Gero, David (1993). Aviation Disasters: The World's Major Civil Airliner Crashes Since 1950. Patrick Stephens Limited. ISBN 1-85260-379-8. ^ "ASN Aircraft accident Boeing 72764 XA-SEL Monterrey-Gen. Mariano Escobedo Airport". AviationSafety.net. ^ "ASN Aircraft accident Boeing 72764 XA-SEJ Mexico City-Juarez International Airport". AviationSafety.net. ^ "ASN Aircraft accident Boeing 727264 XA-MEM las Mesas". AviationSafety.net. Wikimedia Commons has media related to Mexicana de Aviación. This article based on this article: Mexicana_de_Aviaci%C3%B3n from the free encyclopedia Wikipedia and work with the GNU Free Documentation License. In Wikipedia is this list of the authors .